Set of white metal Liverpool driving bits decorated with the emblem of the Seal of the President of the United State of America at the larger connecting links; presented in a shallow red fabric presentation case with the seal of the President at the centre. 2011 marked President and Mrs. Obama's first state visit to the United Kingdom and these driving bits were presented to The Duke of Edinburgh. They reflect The Duke's interest in carriage driving, and the high quality of equestrian metalwork produced in America. 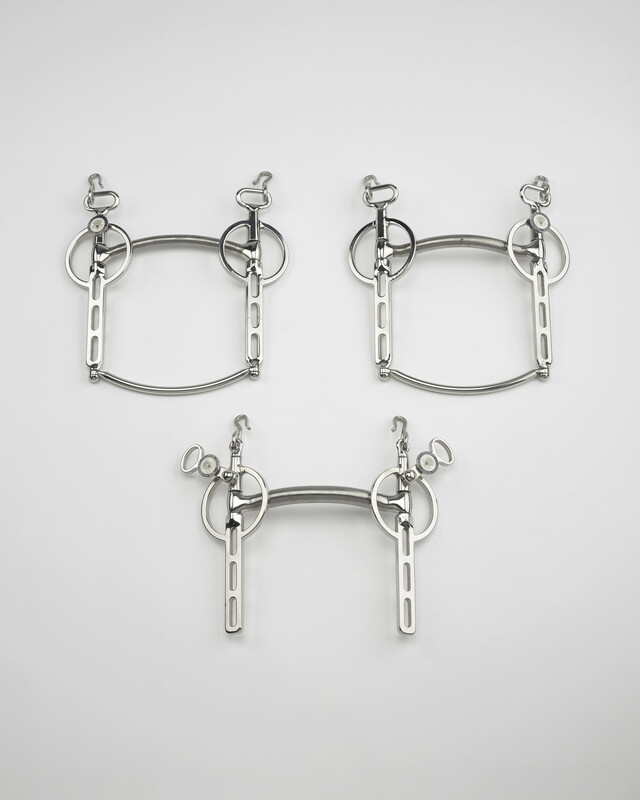 The Liverpool bit is a common type of driving bit, which allows one or two pairs of reins to be attached to the lower cheekpieces, which alters the strength of the bit's action on the horse's tongue. These examples would fit a middle-size horse, but as a presentation set they have not been used. The set came with two types of mouthpiece; this straighter variety and a stronger rolled metal piece. They were presented alongside a set of horseshoes worn by the champion American carriage horse Jamaica. He won six U.S. National Championships, two FEI World Equestrian Games and four world championships (from 2002 to 2008).